The first Shanghai Football Club was founded 25 November 1867, thereby making it the first rugby club to be established in China. The initial football rules it used were based on those used at Charterhouse School in the UK. However throughout the life of this first Shanghai Football Club there was constant and heated debate about which football rules to use. In common with many clubs in England the debate centered on whether to use the dribbling rules, i.e. more like association football or the handling rules more like rugby rules. The irony of these heated debates was that the week before the Shanghai Football Club was founded, a letter written to the North China Daily News on 18 November 1867 by Balbus suggested that ‘the rules are so simple that they can be learned in a short time‘. 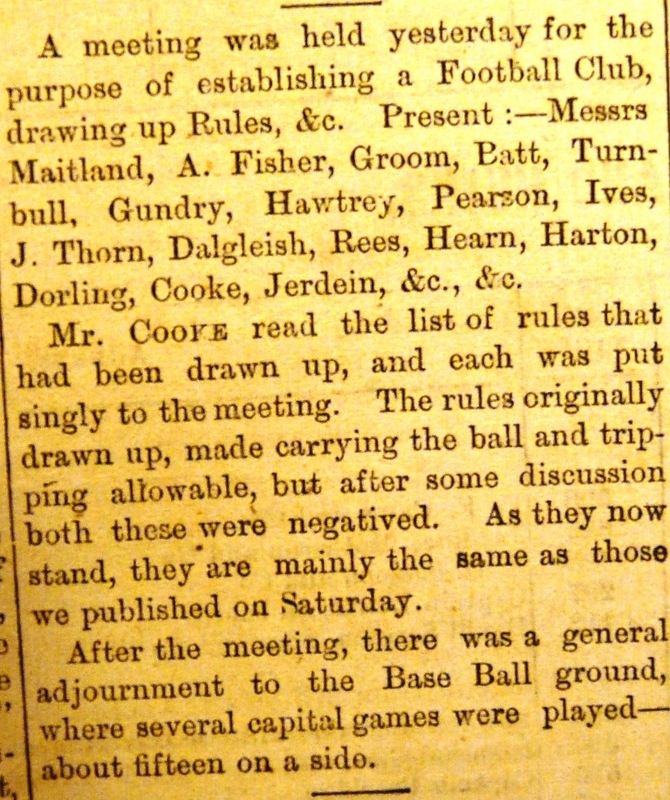 A friendly game was played on 19 November and was so agreeable that a meeting was called to form a club. The club was duly created and another game played immediately after the meeting. A series of further games were arranged against the Royal Navy. All matches were played inside the racecourse grounds on the site of the current day People’s Square in Shanghai. The first named person to score a goal in Shanghai was a Mr. Bird who made his piece of history on 19 December 1867. The first season finished soon after. The second season, which ran from end November to end of December 1868, comprised eight matches played using a hybrid mix of various football rule books. The first Shanghai Football Club carried on for another two seasons before playing its final game in December 1870. Shanghai had to wait another five years before the next organised football game was played, an ad-hoc fifteen-a-side game in November 1875. It would be a further six years before the second Shanghai Football Club was created in 1881 again playing both rugby and association rules. You can find out more about the history of rugby in Shanghai by visiting the temporary exhibition currently running at the World Rugby Museum. About the Author – Simon Drakeford is a sports historian, writer and former member of Shanghai RFC. He is the author of ‘It’s a Rough Game but Good Sport’. The World Rugby Museum would like to thank Simon for contributing this article.